I can remember sitting in an English class at secondary school, a long time ago, as my English teacher (incidentally, the best teacher I had at that school) got us to read a short story: Graham Greene’s “The Destructors”. I think it’s a testimony to Graham Greene’s skill that I could still remember the outline of the short story and the effect it had on me when I read it twenty years ago. Anyway, the point is that I still have the short story collection that we used in school all those years ago, so I figured it was about time I reread “The Destructors” and also read the other stories in the book. In making this selection we chose stories that were not only immediately enjoyable, but worth re-reading because they had so much to offer. In this aim I think the editors succeeded, as there is much to reflect upon in each of the tales. Lack of time prevents me from writing much here at the moment, but certainly each story is thought-provoking. Conrad explores the psychological strain and isolation of a young ship’s captain who is faced with an unexpected situation, and how he struggles to reconcile the expectations of his role and of the external law with what you could call his inner moral law and what he thinks is the more humane thing to do. D. H. Lawrence covers ground that he explored more fully in some of his more famous novels (that is, the lives of poor workers in a dreary coal mining community), but E. M. Forster’s tale takes us to a futuristic setting that is a world away from the Edwardian well-to-do society settings found in many of his more famous novels. To my mind the best two stories are the ones by Saki and by Greene. In “The Lumber-Room”, the author contrasts the cruelty, pettiness, and lack of imagination of a “respectable” adult with the inventiveness and simple joy of a child. In “The Destructors” Greene also focuses on some adolescent boys, but here their “mischief” spirals into something much darker than we might at first expect. The story is set just after the Second World War, and revolves around a two hundred year old London house that had narrowly survived the Blitz. Here there is a distinct lack of innocence amongst the gang of boys and the story raises questions about the effect that living through the violence of war had on children. The tale also highlights the bleakness and the apparent absurdity of life from the perspective of the poor young lads who have little to aspire to. Graham Greene throws together destruction and creativity, violence and careful planning, criminality and dedication in an unexpected and somewhat troubling mix. It is a very powerful and thought-provoking piece. Apologies for the short review, but tempus fugit and all that. I will shortly post about another novel I’ve just read, but in the meantime: Happy reading! After reading Goodbye to All That, next in my To Read pile was a book that a good friend (who is currently living in the heart of Hardy country) recently sent me: Thomas Hardy’s Wessex Tales. This was quite a fitting follow up to my previous read, as Robert Graves mentions visiting Hardy in his autobiography. At this point, I feel I must make a public apology: I somehow managed to get through an English literature GCSE, an English literature A-level, and an English literature degree without reading a single Thomas Hardy work, which seems somewhat ridiculous. However, I did read Tess of the d’Urbervilles a few years back, which I half like and half tremble at the thought of. Tess is clearly a classic tale; evocative and memorable, yet it is also quite possibly the bleakest book I have ever read! Still, I know several people who love Hardy’s works and who have recommended them to me, so a collection of stories seemed like a good next step. Plus, I was hoping that this 1988 collection might not be quite as bleak as Tess of the d’Urbervilles was. [After many years, just when all external barriers to their love have been overcome] Lucy went herself to the Black-Bull, and questioned the staff closely. Mr Barnet had curiously remarked when leaving that he might return on the Thursday or Friday, but they were directed not to reserve a room for him unless he should write. He had left no address. Lucy sorrowfully took back her note, went home, and resolved to wait. She did wait – years and years – but Barnet never reappeared. And that’s it. The end. “She did wait – years and years – but Barney never reappeared.” A true Hardy tale! Actually, I’m being rather misleading with this review, as I did actually enjoy reading these tales a lot. There are some great characters and the stories provide fascinating depictions of life in rural towns and villages in the mid nineteenth century. If you liked this you might also enjoy Laurie Lee’s Cider with Rosie. And if you can stomach the relentless sadness, you might like to try Hardy’s Tess of the d’Urbervilles. Those of you who follow such things will know that the Canadian author Alice Munro was awarded the Nobel Prize in Literature last year. 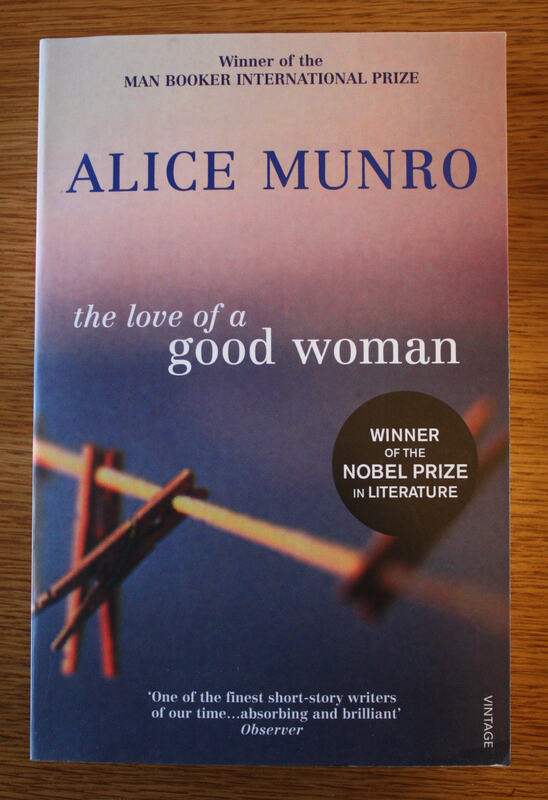 If you have not heard of her before, it might be because Alice Munro is not a novelist; rather she is a prolific short story writer, who was credited as being a “master of the contemporary short story”. Anyway, the publicity was enough to make me curious to read one of short story collections, and I chose The Love of a Good Woman. The collection comprises eight longish stories, ranging from thirty to seventy-five pages in length. The stories are all set in Canada, with most being in Munro’s own home town of Ontario. Most stories have a central female character, and explore her relationship with her mother, husband, or daughter. The stories focus on the lives of ordinary people and explore the nuances of their relationships, their passions, and their failings. Despite the collection’s title, there is little romanticism here. The characters are all fairly limited in their own ways, there is as much miscommunication as there is connection, and the outcomes are rarely what the characters had hoped for. Unusually, many of the stories cover long periods of time, with Munro sometimes skipping backwards and forwards within the same story. This is, of course, a technique not uncommon amongst novelists, but I do not remember seeing it employed by a short story writer before. When I finished reading my last novel, I decided that it was high time to sample some more short stories. I know that not all fiction fans go in for the short story form (my wife, for example, reads many a novel but never touches short stories), but I like reading some every now and then. Whilst you perhaps do not get the same depth or breadth as you get in a longer work, the very fact that each one is much less of an investment means that they are a great way of exploring new authors or genres. 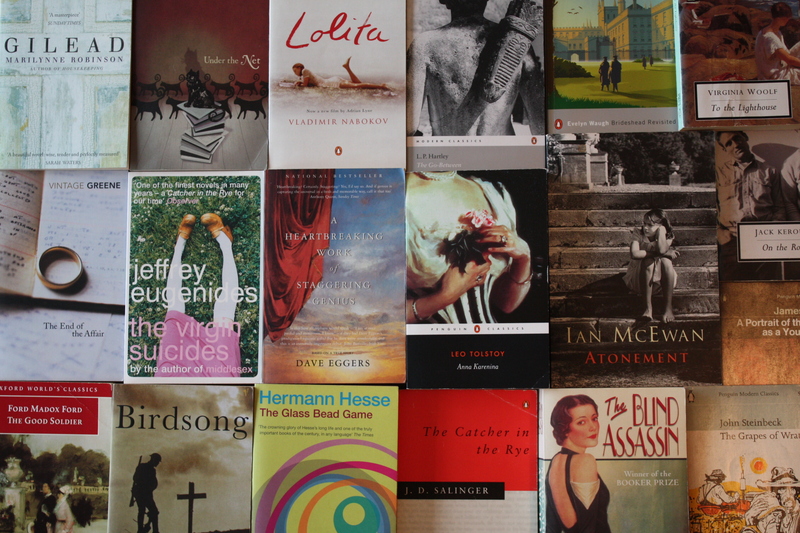 The years since World War II have seen an exciting resurgence of the short story. From Albert Camus to William Maxwell, from Amos Oz to R. K. Narayan, from Ann Beattie to Yukkio Mishima – this incomparably rich and diverse collection attests to the vigor and excellence of the modern short story throughout the world. I actually bought this volume ten years ago, when I took a creative writing module whilst at university. However, I only read about a third of the stories at the time (I know this as the ones I’ve read are dated), and the hefty tome has sat on my bookshelf, largely untouched ever since. Until now, that is. And this is exactly why good books should be kept, stored and treasured on your bookshelves, not discarded like used toys. I knew that I wanted to read the remaining stories, and was confident that I would indeed do so. I have had plenty of books that have sat on my bookshelves for some years before I have read them, and I have plenty still. I’m not talking about books that I have no intention of reading (I have no interest in keeping a book I have neither read nor intend to read); I am talking about books that I know I want to read, even if their turn does not come for some time. In this sense, I guess I view my bookshelves the way some people view their wine cellars. I want to good, well-stocked bookcase so that I can be confident of always finding something to suit my mood any time I want to read a new book. I haven’t read any short stories for a long time, so when I was perusing the bookshelves, trying to decide what to read next, I ended up plucking out this small volume of Graham Greene stories, which he first published back in 1963. I cannot remember with any certainty when I picked up this book, but it was certainly several years ago, possibly in a second-hand book shop in Brighton. That’s the great thing about picking up second-hand books: when you see something you think you may be interested in reading one day, you can purchase it for a pound or two and add it to your bookshelf, then one day months or even years later, that book grabs your attention afresh and becomes the right-book-at-the-right-time for you to read. So, what is A Sense of Reality like? It is a collection of just four (admittedly, fairly long) short stories. I guess this is an ironic title, in that the four stories contained in this volume all involve dreams or fables or childhood fantasies. 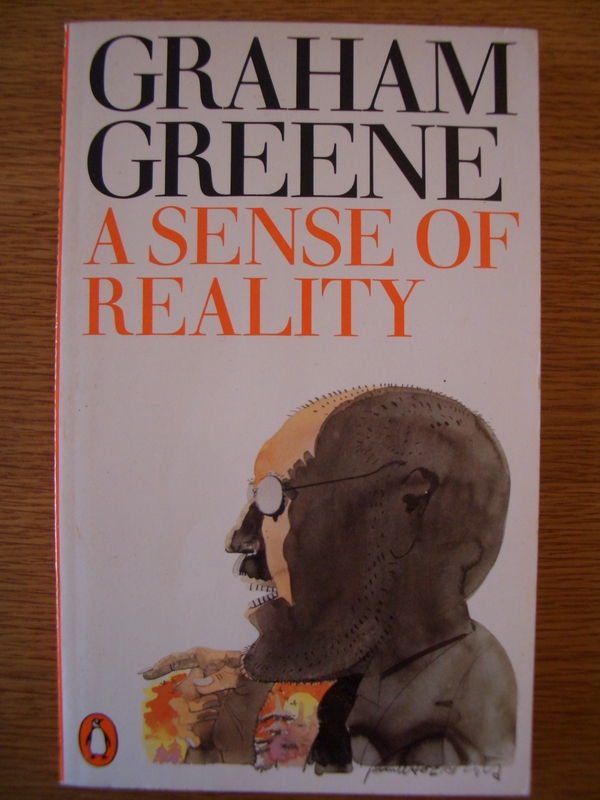 So, unlike most of Graham Greene’s writing, which is very much based in the hard, gritty everyday world, here Greene experiments with slightly more ambiguous scenarios. Are the stories any good? They certainly are. The writing is fairly terse, but no less effective for it. In fact, I found reading these shorts a bit like reading an Ernest Hemingway story: the prose is almost deceptively simple, yet it hooks you in a treat and keeps moving forward at a sound pace. Plus, as you would expect with Graham Greene, these are thought-provoking pieces. They four tales deal with the unconscious, faith and doubt, mortality, and myth and fable, respectively. Quite a feat for just a hundred and four pages! This has definitely made me want to read or re-read one of Graham Greene’s novels. If you liked this, you might also enjoy: some of Ernest Hemingway’s short story collections – for example Men Without Women, or The Short Happy Life of Francis Macomber. Alternatively, do try one of Graham Greene’s fine novels, such as The Power and the Glory, or The Heart of the Matter. I didn’t quite know what to read next after finishing Lord of the Flies, so thought I’d turn to some short stories before choosing my next novel. I first read some F. Scott Fitzgerald short stories years ago, and have managed since then to pick up all five volumes of his collected short stories in second-hand shops. The Diamond as Big as the Ritz and Other Stories is actually Volume One of the Penguin series I have collected, although the stories themselves are not his earliest ones, so I don’t know quite what logic the good people at Penguin were following when assigning his stories to their five volumes. 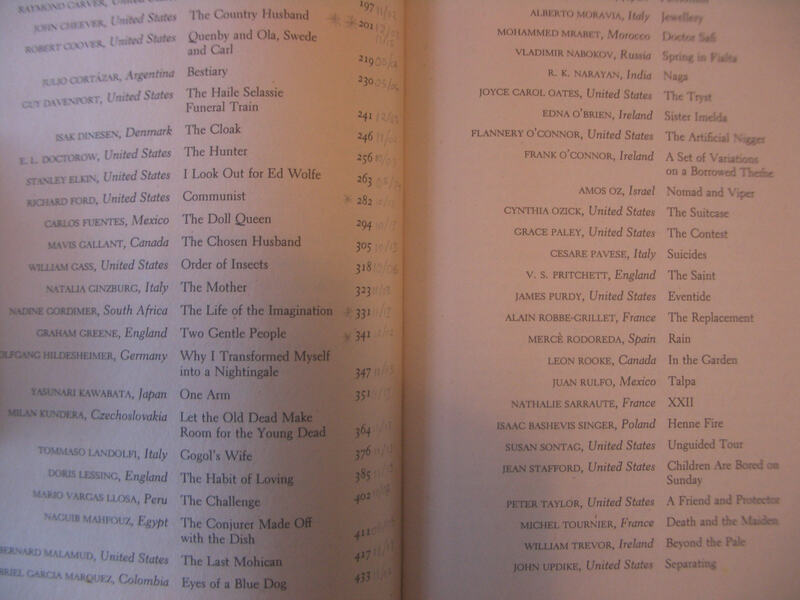 Several of the titles contained in this collection indicate that we are in typical Fitzgerald territory: listed on the contents page we find ‘The Cut-Glass Bowl’, ‘The Diamond as Big as the Ritz’, ‘The Rich Boy’ and ‘The Lees of Happiness’. However, there are also stories here that are not set in the rich, high society life of 1920’s New York, such as the interesting vignette, ‘An Alcoholic Case’. Let me tell you about the very rich. They are different from you and me. They possess and enjoy early, and it does something to them, makes them soft where we are hard, and cynical where we are trustful, in a way than, unless you were born rich, it is very difficult to understand. … Even when they enter deep into our world or sink below us, they still think that they are better than we are. They are different. Although the collection is not uniformly brilliant, it is certainly worth a read. 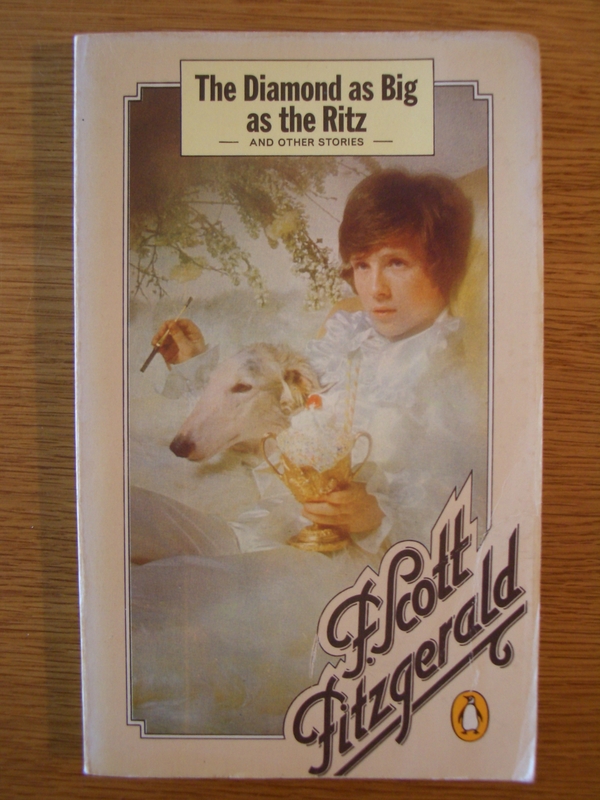 As intriguing and entertaining as it is to read about the glitz and glamour of high society life is, it isn’t this that draws me back to read more F. Scott Fitzgerald; it’s his ability – when writing at his best – to construct and present such real, such whole characters. Even in short pieces he is sometimes able to convey so much about an individual, yet without seemingly stating all that much. It is this ability to show, not simply to tell, that makes Fitzgerald such a great writer. I was given this collection of Anton Chekhov stories last Christmas and I read the first half in the New Year but then took a break to read other things. However I have recently picked up the book again and have really enjoyed reading the remaining stories of this great collection. In many ways a lot of the stories seem fairly sparse, inconclusive and incidental, but therein lies the genius. In his stories Chekhov paints pictures of typical Russian life: the rambling thoughts of an old professor, a meeting between a huntsman and his estranged wife, the daily work of a doctor, the life of a young lady engaged to be married – each described in some detail, yet without explicit authorial comment. We read of an affair, but are not given an opinion of it. In this respect, I found that the power of many of the stories only struck me some time after I had finished reading them. As we are not instructed in how we should react to the scenarios we have to grapple with them ourselves. 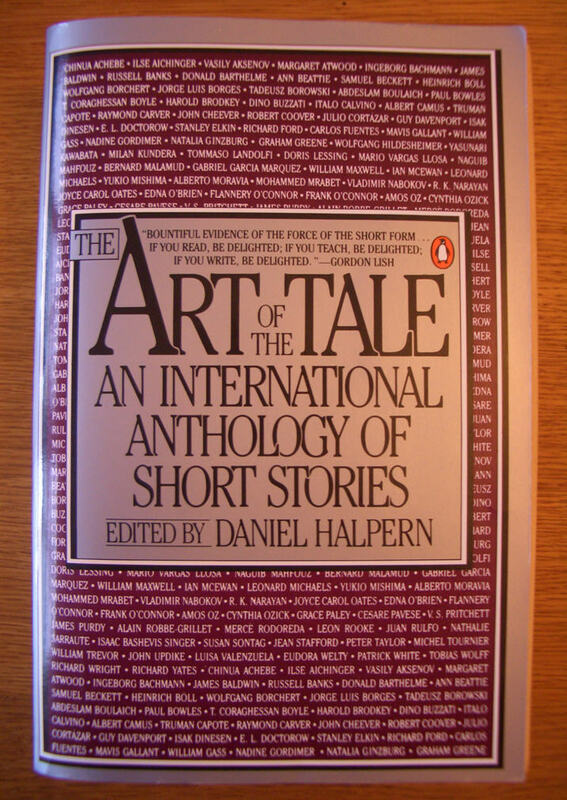 Of the thirty individual stories in this collection, my favourites were A Boring Story, Ward No. 6, The Black Monk and The Lady With the Little Dog. However, I think that the whole collection is well worth reading and I imagine that I will likely dip into it again over the years.